This is a little street I’ve been working on. I don’t know wat to do next… What could improve it? you have a scene… now put something in the scene… person… vagrant… stray dog… a really nice car would stand out in an unusual means… bicycle leaning ont he wall perhaps? Try to simulate maybe a sunset lightning by experimenting with some orange lightning. Also, scale your Brick wall texture down a notch. More dirt on the awlls and so, especially near the ground. candy wrappers and stuff on the ground. Go out on a street in your hometown and try to really pay attention to all the details and compare it with your scene. Thanx for all the ideas! I’ll try them out. The bricks are too large: they look like brick colored concrete blocks. The edge at the door opening needs some details, some kind of framing. Now the brick texture just stops abruptly, sometimes in unlikely places, like on a mortar joint. Real bricklayers start at openings, and make adjustments in the middle of walls, where it isn’t noticable. The brick texture does not go into the door opening, and it should go at least one brick depth into the opening. The window frame sticks out beyond the bars on the windows, usually it’s the other way around. The cobblestones come right up to the top of the curb, usually there is a gutter at the edge of the roadway. In cases where the road drains in the center, the cobblestones should slope down toward the middle of the road, and even then, there is usually a height difference between the cobbles and the curb. Juggler mentioned electrical stuff on the walls, other additional details would include a mailbox for the people living or working up the stairs, address numbers on the wall, possibly some light coming out of the stairwell. Good start, but it needs some punching up. 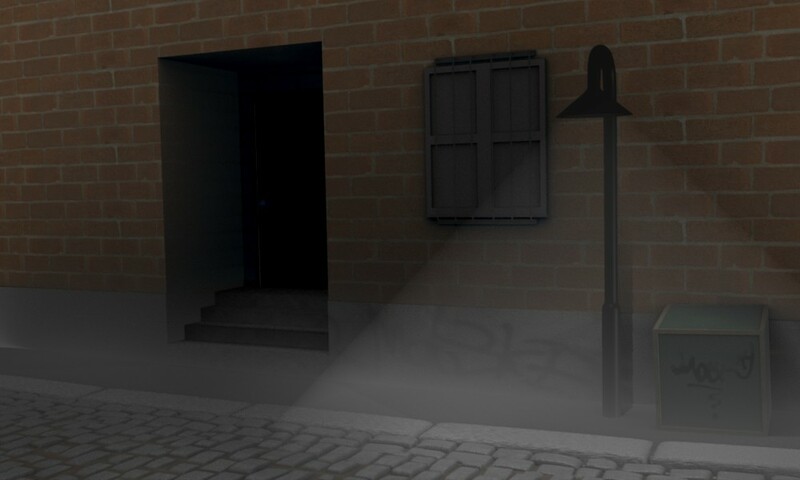 Also the street light is far too low, assuming that the stair entrance is about a foot bigger than standard human height, it seems that alot of people would have to duck to be able to walk under it. Agree with Orinoco about the brick side too.